I’ve mentioned before that I don’t watch much TV. If I’m honest, what I should say is I don’t watch much TV when Downton Abbey isn’t running. I am one of the millions who have been sucked into this show’s never ending plot line, stunning scenery, and tantalizing costuming. The show’s strengths to me are the always interesting characters and the way it takes viewers right back into a different time and place. I really do enjoy it. Well, I did, through the second half of the third season. After that, I began to make critical remarks like “This is just a dressed up soap opera with talented actors,” and desperate remarks like “I just want some resolution at the end of a season!” Even so, I’m still watching it and my imagination still enters into that world. By the end of each season, I vow I am done with the show forever. But I always end up watching the next season. Even before it comes out in America, I’m watching it. Either I’m a liar, or I simply can’t stick with my resolutions. (Yes, I’ve already seen Season 4). But this time, I think am for real. Because Downton Abbey has ruined me for everyday life. I knew I had a problem when I started imagining what it would be like to walk into that spacious living room (or any room!) that was always clean in the morning. And not because I cleaned it or even gave a thought to whether it was clean or not. Those house servants are more like house elves, taken for granted and striving to be invisible. That very first episode of Season 1, when the servants are scurrying around cleaning before the family awakes…sigh. I walk into a living room that looks the same as it did the night before. I look around my bedroom and think, “What in the world would Lady Mary say if her room looked like this?” She’d probably raise cane if her PERfumes were slightly disarrayed on her dressing table. We all know the Dowager Countess (whom I can never refer to as just ‘Violet’) would slay her entire household staff with her tongue if her bedroom contained so much as a stray book. What about a box of strewn Legos and three baskets of unfolded laundry? And what would it be like to order the menu and then not given it another thought? No cooking, no cleaning, no shopping. Luxurious, that’s what it would be. Of course, I longed for a spotless house before Downton Abbey was a show. But somehow, my sense of entitlement has grown through watching those revered Crawleys. I have no idea why I think I would be upstairs and not downstairs in the great house if I were actually transposed into the life of Downton Abbey. Probably because of those stupid and irresistible “Which Downton Character Are You?” quizzes, in which I am either Lady Sybil or Cousin Isobel. Yes, clearly, I am worthy of all that luxury. Why do I think like that? 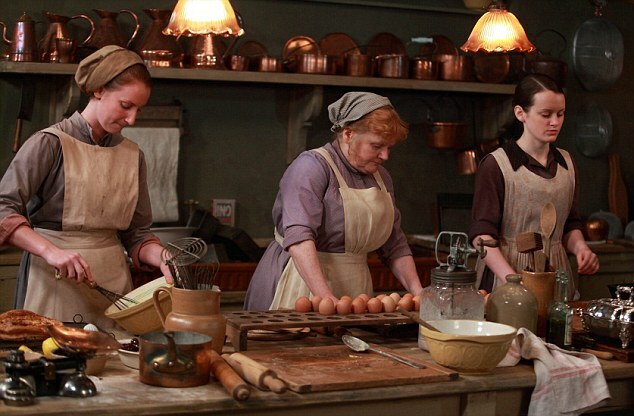 Why am I not giving a thought to the very real possibility that I’d be a scullery maid? What saves me from this Downton inspired pity party is the scenes when Lady Mary or Tom Branson are with their children. Tom is alright, but Lady Mary is terribly stiff. She somehow finds time to give her son his supper between her day of social engagements and estate management and dressing for dinner, but it’s a rarity. That small amount of interaction with my own children would kill me. The actual life that the upper class had to maintain in that time period would kill me. The reality? Chances are slim I would be part of the upstairs family. I’d like to think I’d be a nanny. Not the nasty one, but a fun one who lets the future lords and ladies run around in grassy fields and tells them silly stories. I’d dress them and send them down after their tea to see the family for a few minutes before the adult dinner, and be so glad to get them back in the nursery afterwards because those adults are simply terrifying. I’d be filled with relief not to have to think of inane dinner chatter, or remember how to address every earl and his extended family in the county, or choose a husband from these suave, well-trained suitors. I’d never do anything jolly to my hair. I’d be relieved not to be in the humming, performance driven, high society family. And I’d be lonely. Just like almost every other Downton Abbey character. This messy, middle class house that I’m mistress of in reality is looking pretty beautiful right now. Still, I wouldn’t mind an Edwardian dress or two. And yes, I will be watching Season 5. But I’ll remember to be glad for who I really am and who I’m not. Lady Mary can keep her maid, her jewels, her cutting wit, her stunning estate, and her corset. I’ll take these jeans and sweaters and my gorgeous family tumbling around me over all that any day.